Slicing and serving round cakes is a messy task. Removing the cake from the pan is tricky and the first piece to be cut often gets broken and the pieces are never the same size. 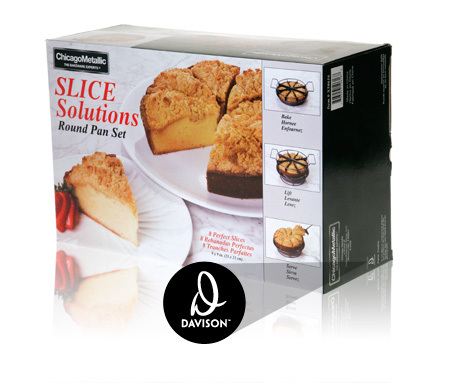 SLICE Solutions Loaf Pan Set solves the problem through its innovative four-piece baking set that enables the user to bake, lift and serve eight perfect slices of cake! The manufacturer turned to Davison to create packaging that would communicate all the great features of the product and give it a high-end look. 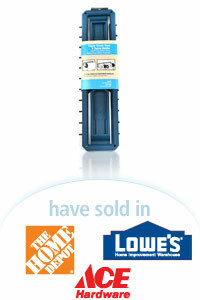 Davison created a package design that thoroughly accomplished the goal. The sleek, classy graphics clearly communicate all the features of the product and the simple steps to creating eight perfect slices. The easy-to-read instructions are provided in three languages, English, Spanish and French, and the graphics not only make the product attractive, but make the mouth water for the delectable cake pictured. The package, which bears the Davison “D”, is perfectly sized for optimum display on a store shelf.